A sad state of affairs on looming Australia Day. With an overall very low performance, Australia ranks 55th in this year’s CCPI. The country continues to receive very low ratings in the categories GHG Emissions, Energy Use and Climate Policy. The country ranks at the bottom of low performers in the Renewable Energy category with national experts criticising the government for not putting forward any plans for renewable energy beyond 2020. Experts argue that national climate policy has continued to worsen – the government has no comprehensive emission reduction policy, no regulation of transport emissions and no plans to phase out coal. Experts observe that the government has become an increasingly regressive force in international negotiations, attempting to weaken climate finance obligations and dismissing the IPCC 1.5°C report. I am desperate and keen to have a positive something to say about Australia, the country my parents chose to migrate to back in 1956. With Australia day coming up on the 26th of January, can some of you please, guide me to a distinctly positive item that Australia excels in. Lately we have been inundated with bad things. We have a Royal Commission on aged care. Last week we watched how elderly are being strapped down in a chair for up to 14 hours and no toilet breaks. A man suffering from dementia was seen reduced to a vegetable, all bent double over, strapped on his chair. This was hard on the heels of video footage by combat troops with assault weapons at the ready, trained on children at a juvenile detention centre. It just doesn’t seem to stop. The best thing that Australia almost achieved, but not quite, was allowing a Saudi girl in Australia. Sadly this did not happen either. We will now see how all those dead fish in our largest river will survive. I don’t like their chances either. I suppose a good thing that has happened is that the weather is now a lot cooler. For the moment we can turn off our air-conditioning. So…Aussi, aussi…oi oi oi. The Sting is in the Tail. The week was difficult enough without the US election. The only light was that the shivers down my spine proved right. Calamitous is a word that got much used. We decided to do a practise run and booked a cabin all secluded. We are fully expecting the possibilities, that once again, town-hall sirens will blare and warn the people of an impending disaster. It wasn’t just the Trump tragedy but also Leonard Cohen passing. To mention both in one breath is a bit of an insult to Cohen. Like comparing acrid acid with the tasting of the finest of first-press olive oil. But Cohen is at peace and we are still here! The three lily- white blondie livery daughters of Trump are primed to fill important roles and he is backing down from undoing Obamacare. His mascara has come off and paleness replaced brashness and red-necked bully-boy. The markets are going wild and gyrating madly opposite of all expectations. The biggest rally for years. All topsy-turvy. Yet, Hillary Clinton all pale and sad. What has America done? Protests on the streets. Cars are burning. People shouting. Contorted faces. Rage is rising. As I was walking along the beach I noticed a dark shape in the water. Getting closer I was amazed to see a large stingray. 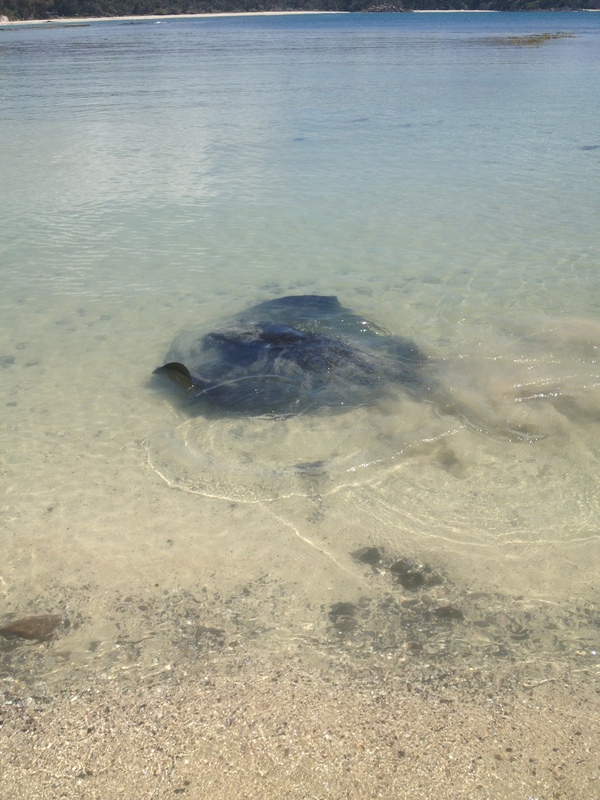 Steve Irwin, the Australian naturalist was killed by a stingray while swimming above one. The barbed tail whipped up, went through his wet-suit and penetrated his heart. He died almost instantly. It was a somewhat helpless situation but I took some more pictures with my IPhone. What else would anyone do? But what followed was remarkable. 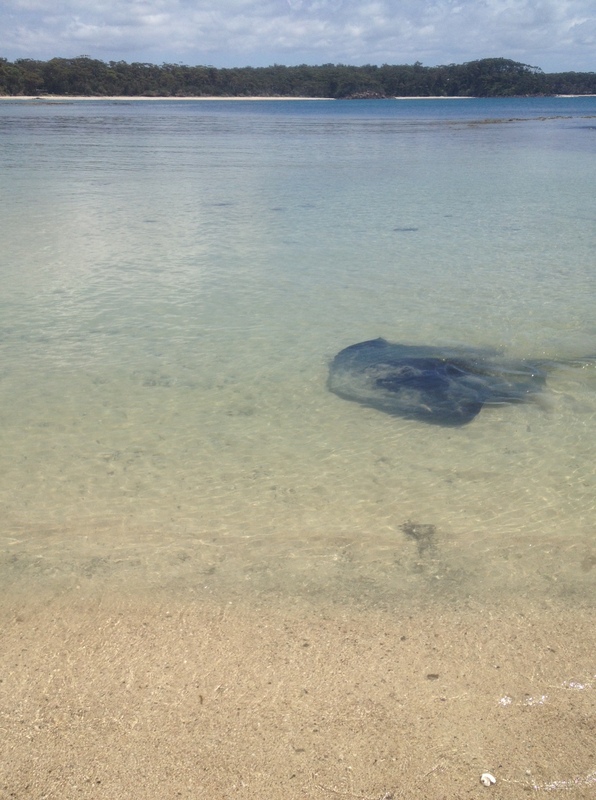 As I continued my walk, the stingray followed me for some twenty metres or so along the edge of the sea. Had I been accepted as his friend? I again took some pictures. He then had enough and swam away. The aboriginal midden was still there and in good condition. I suppose all the seashells and cockles are just not worth digging up or scooping away as most people might not even be aware of its significance and aboriginal heritage. For thousands of years this was the site were the original owners of this land would congregate look out over the sea and consume their catch of sea-food. Sacred aboriginal sites are to be respected and not to be photographed.